of England before you bump into a shipwreck: we have wrecks off our coast dating back to the Bronze Age. These are witness to hundreds, if not thousands of years of trade in cargo, people and ideas – and wars. They and their artifacts can tell stories that even the history books can’t. 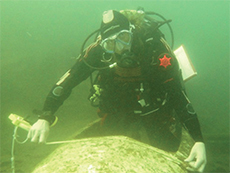 Now a new PADI speciality course set up and run by the Maritime Archaeology Sea Trust (MAST) aims to help you understand what you are seeing and equip you with the basics of underwater archaeology, how to record and understand what you are seeing. or technologically advanced piece of equipment, comparable to today’s space exploration. Enter the vast amphibian army of fearless British sports divers. Armed with little more than tape measures and cameras, students will learn over two days just how much of a difference they can make in preserving our underwater heritage. 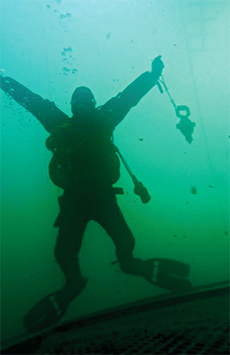 The course is taught in Plymouth and since the practical diving sessions take place in a sheltered water training area, no foul weather or badly timed tide can stop us. Students are taken through the basics of simple yet crucial recording techniques used by archaeologists the world over. An introduction to the laws governing divers and underwater archaeology is also included, and very often visiting lecturers from the maritime archaeology world will give a talk on their experiences. Recently students have had the chance to hear Pete McBride discuss the work on the Coronation shipwreck and Dave Parham speak about the excavation of the Swash Channel wreck, the biggest shipwreck excavation since the Mary Rose. The course costs £185 for the two days. The price also includes a reduced price voucher to dive the Coronation protected wreck site, guided by one of the licensees, an expert on the site and its history. All the profits from the course are donated to MAST to contribute to underwater heritage research projects. PADI instructors, who would like to teach it themselves, are encouraged to discuss this with their instructor.